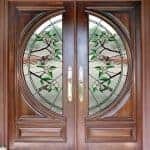 This 36″ x 96″ Mahogany “C-2″ Style Door is matched with 2 Custom 18″ x 96” Sidelites, both have Leaded, Textured and Beveled Glass. The door is dressed with Fluted Molding, Rosettes, Ledge and Dentil. 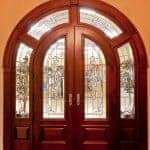 The grandeur of the entryway is enhanced by the Palladium Transom with a beautiful Leaded, Textured, and Beveled glass design. The hardware chosen for this Entry is Baldwin Monterey. The Stain Color is Dark Walnut.